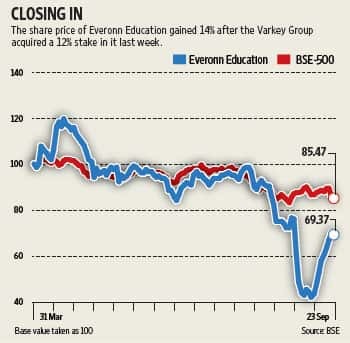 Everonn Education Ltd’s shares have gained 14% since the Dubai-based Varkey Group acquired a 12% stake in the embattled company. The white knight investor became a co-promoter and triggered an open offer for Everonn, which starts in November. The price for the open offer is set at ₹ 528 a share, a 32% premium over Friday’s closing price. In case of the first option, brokerages say investors can expect only 40-50% of their holdings to be picked up. According to Indian merger rules, the Varkey Group has to make an offer for only 20% of shares. That means that, in all likelihood, all the shares one tenders won’t be bought. But ₹ 528 may well not be the intrinsic value of the shares because the Varkey Group may very well be paying a control premium. So where will the share price settle once the open offer is closed? Let’s assume a 50% acceptance of shares, and a 10% per year opportunity cost of holding on to the stock. Then investors will be better off holding on to their shares (for the open offer) if the stock settles at ₹ 293 a share or higher, after the offer ends three months hence. But the intrinsic value of the shares is a bit difficult to calculate. In terms of a calendar 2012 EV/Ebidta (enterprise value/earnings before interest, taxes, depreciation and amortization) valuation, Everonn trades at 3.1 times, according to Ambit Capital Pvt. Ltd estimates. That certainly looks more attractive than peers such as Educomp Solutions Ltd and NIIT Ltd.
Will earnings continue to grow at a fast enough pace? Sure, the June quarter results looked pretty impressive, but Everonn is diversifying and the balance sheet looks wobbly. “Why have Everonn’s debtor days risen to over 200 days? Is this due to aggressive revenue recognition or deterioration in quality of receivables?" asks a recent note from Ambit. Everonn’s capital expenditure rose to ₹ 110 crore in the June quarter compared with ₹ 220 crore for the whole of the last fiscal. As a result, the company’s free cash flow has been negative for the past two fiscals and brokerage estimates forecast this trend to continue this fiscal too. This, at a time when the firm is looking to move to less-capital-intensive businesses such as K-12 schools and deciding to lease rather than build. The new management adds greyness to this whole mix until they state their focus.